Up north safety ltd now supplies and installs the Freestand system of permanent freestanding edge protection, a great solution for flat roof edge protection or for designation of access and escape routes. 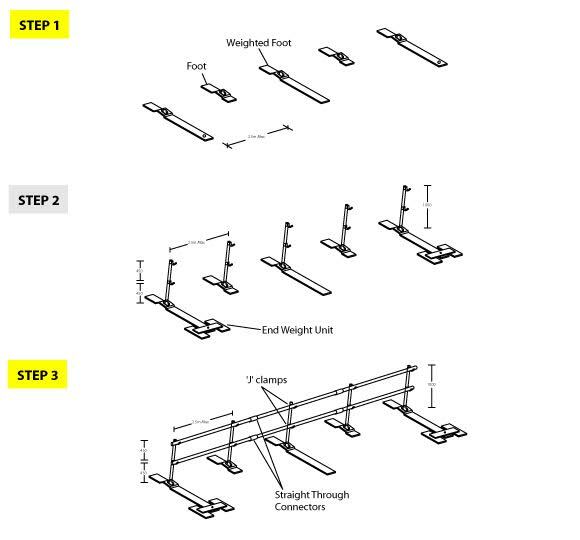 Freestand Roof Edge Protection is a counterbalanced guardrail system that is tested and certified to BS EN 13374 as a Class A protection system. This provides protection for worker safety at height. With no penetration or damage to the roof, the Freestand system is easy and quick to install and can be used on virtually any flat roof surface. With the use of counterbalanced arms, end weights and a range of clamps and tube, all in a 48.3mm diameter, hot dipped galvanised steel, exposed or unprotected flat roofs can become a thing of the past. Please note that new asphalt roofs may require tiles beneath base assemblies to prevent the system from sinking, with advice sought from your asphalt manufacturer. Step 1: Using M10 nuts and bolts connect the base clamps to the feet. Feet should be spaced at a maximum of 2.5m alternating between weighted and standard feet. Step 2: Insert upright tube section into the base clamp, complete with 'J' crossovers at 500mm centres. Where handrail system terminates 'End Weight Units' should be secured to weighted foot. (End weight units are not required where handrails are secured to a wall). Step 3: Cross rails can now be inserted and secured into the 'J' clamp fitting. Handrails are connected using the straight through connectors.